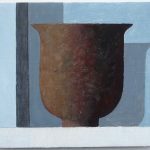 Philip gained a degree in Fine from Bristol College of Art and Design and worked for Phillips Fine Art Auctioneers in London and then Plymouth Museum and Art Gallery. 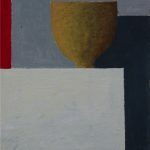 He trained in Art Psychotherapy at Goldsmiths College, London before living in Cornwall from 1989, painting and exhibiting and working as an Art Psychotherapist for the NHS. In 2013, he moved to Falmouth and began to paint full time. 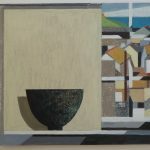 His work is attracting increasing attention with pieces in Royal Cornwall Museum, Falmouth Art Gallery and Devon County Council’s art collection. 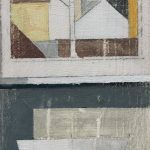 Philip looks for pattern in the landscape and has developed the use of grids to both enliven the surface and give the impression of changing light. His paintings shimmer with light and give us glimpses of a Cornwall that is not necessary the picture post card one. We encounter bungalow rooftops, bits of industrial heritage, a view of the sea glimpsed between buildings. 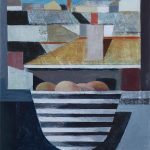 ‘I use subtle colour and strong pattern in my compositions – locking them together to make a firm structure. I pay attention to the surface of the paintings to create areas that have a sense of history (telling a story). There are accents of strong colour to anchor the composition. I look for modest, everyday events and views, such as looking out from a window, light passing over a field, a glimpse of the sea over a hedge and shadows of trees stretching across a field. 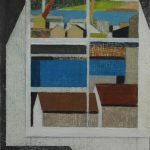 I often use a grid structure to start a painting, sometimes remaining visible, sometimes hidden in the background and I return to places I know well, to look for natural frameworks and grids, such as windows, doorways, shadows and shapes of objects in rooms’, he explains.